1969 was the benchmark year for Ford Mustang in its proliferation of performance names and engines. No less than 6 factory performance Mustang models were available (GT, Boss 302, Boss 429, Shelby GT350, Shelby GT500 and the Mach 1). Additionally, seven variations of V-8s were available in the ’69–’70 models; most of these also available in the new Mach 1. Due to the Mach 1’s success, the GT model was discontinued after 1969 following poor sales of 5,396 units – versus the 72,458 sales for the Mach 1. The Mach 1’s original recipe was simple: It started with a V8 powered ‘Sportsroof’ body and added numerous visual and performance enhancing items such as matte black hood treatment with hood pins, hood scoop (including optional Shaker scoop), competition suspension, chrome pop-open gas cap, revised wheels with Goodyear Polyglas tires, chrome exhaust tips (except 351W 2V), deluxe interior, unmissable livery and dealer optional chin spoiler, rear deck spoiler, and rear window louvers (SportSlats). 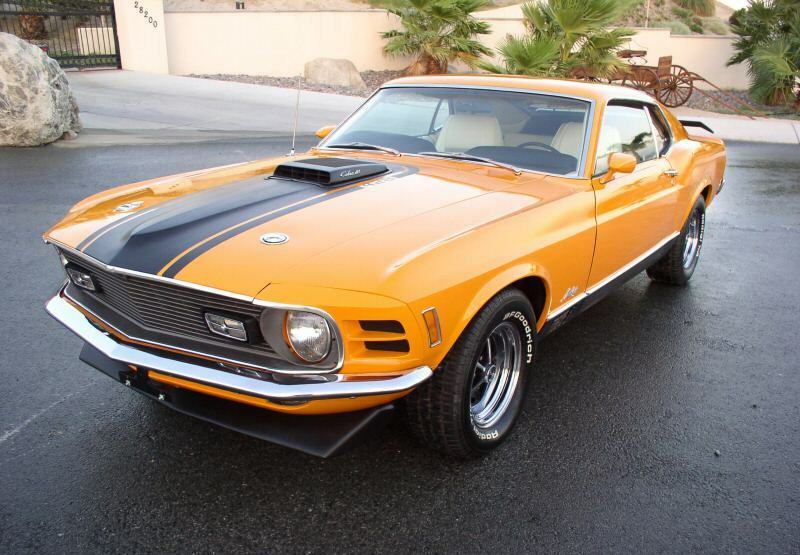 Ford kept the Mach 1 alive into 1970 and little changed other than the visuals. Interestingly, the Mach 1 nameplate could possibly make a return in 2018. If released, it will be powered by a souped-up version of the 5.0-liter Coyote V8 engine, and is likely to slot between the regular Mustang GT and the more powerful Shelby GT350.